Birthday Cookie No-Churn Ice Cream. 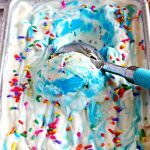 A super easy way to make your own creamy gluten-free vanilla ice cream with chunks of cookies, sprinkles and a blue frosting swirl. Know what my little boy loves more than cupcakes? He LOVES ice cream! I thought it would be fun to make an over the top homemade ice cream to go with his funfetti cupcakes. So I combined two of his favorite flavors, Schär chocolate dipped cookies and funfetti (rainbow sprinkles and a blue frosting swirl). Schär makes some of my family’s favorite gluten-free products! They have everything from certified gluten-free bread, rolls, pizza crust, cookies, crackers, and snacks. The best thing about Schär is not just their wide variety of gluten-free products, but that their products taste amazing! 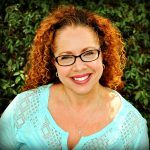 I also love that I can easily find their products at my local Walmart, grocery stores and on Amazon. You can find the closest store near you that carries Schär by using their store locator. Place a 9×5 metal loaf pan in the freezer to chill while you are making the ice cream mixture. Cover and freeze the ice cream for 4–5 hours, until firm. Then scoop, serve, and enjoy! I saved 8 of the Schär chocolate dipped cookies to make ice cream sandwiches (there are 16 cookies to a box). My kids had never had ice cream sandwiches before. They absolutely loved them! Thank you to Schär for partnering with Mama Knows Gluten Free for this gluten-free no-churn ice cream recipe. This no-churn vanilla ice cream is super creamy and easy to make. 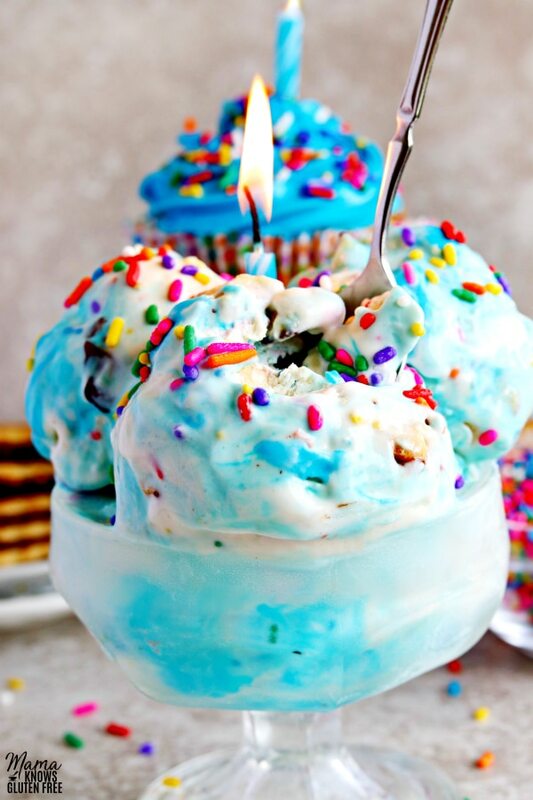 It was so fun to add Schär cookies, rainbow sprinkles and blue frosting swirl to make it an over the top special birthday ice cream treat. This Birthday Cookie No-Churn Ice Cream is perfect for birthday parties, celebrations or no occasion at all! 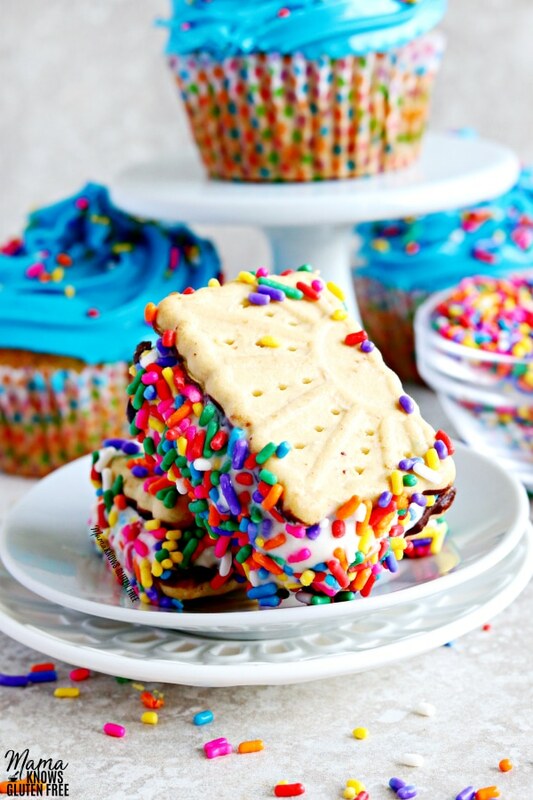 Looking for more Gluten-Free Birthday recipe ideas? Place a 9x5 " metal loaf pan in the freezer to chill. Chop the cookies into small bite-sized pieces. In a large bowl add the sweetened condensed milk, pure vanilla extract, pinch of salt, chopped cookies and sprinkles and stir to combine the ingredients. In another large bowl, use a mixer to whip the cream to stiff peaks, do not to over-whip the cream. Fold the whipped cream into the sweetened condensed milk mixture with a spatula. Pour the ice cream mixture into the chilled baking pan. 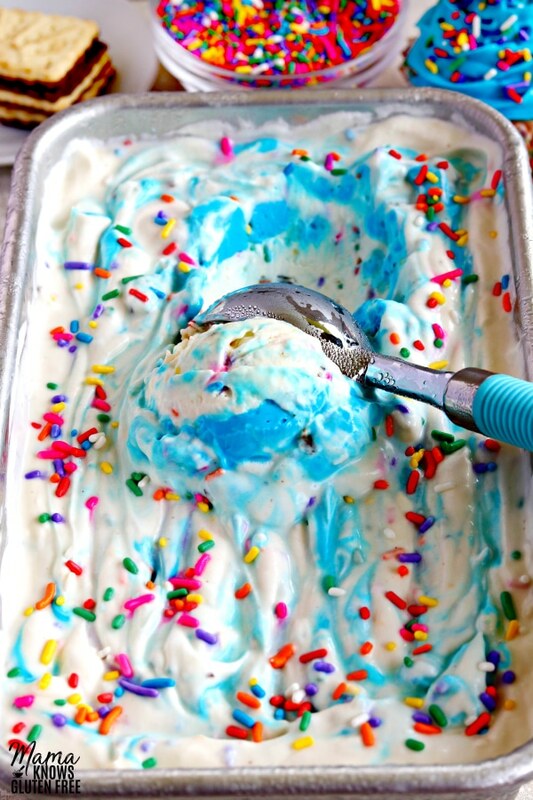 Use a spatula to smooth the top of the ice cream mixture. Drop 6 tablespoons of the frosting on top of the cream mixture and use a knife to make a swirl pattern in the ice cream mixture. 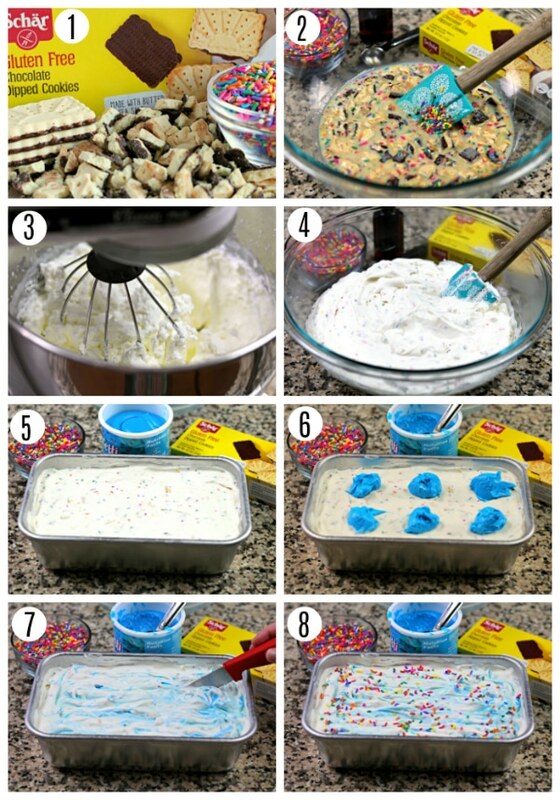 Sprinkle the top of the ice cream mixture with more rainbow sprinkles.